At the invitation of His All-Holiness Ecumenical Patriarch Bartholomew, the First-Hierarchs of all the Orthodox Autocephalous Churches will gather from March 6-9, 2014, for a Sacred Synaxis at the Phanar in order to deliberate on matters pertaining to the entire Orthodox Church throughout the world and procedural issues for the convocation of the Holy and Great Council, whose preparation is coming to an end. 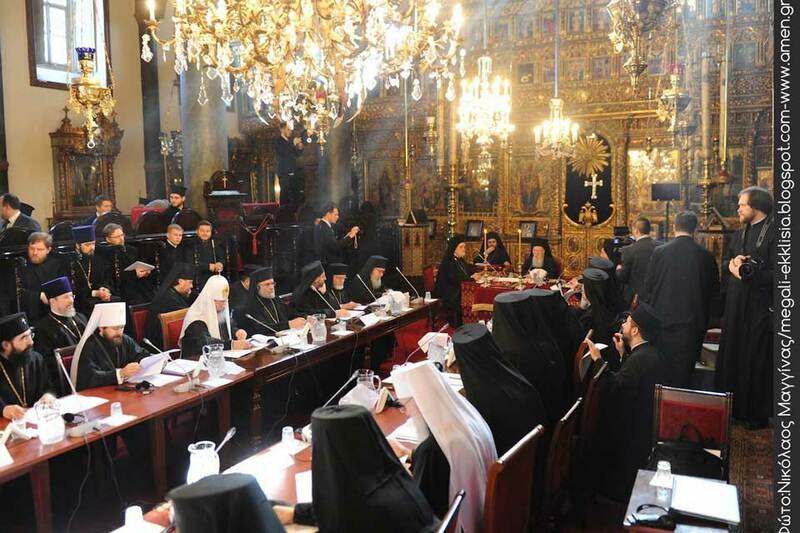 Prior to this, from March 4-5, 2014, a Preparatory Committee for the Synaxis was also held at the Ecumenical Patriarchate, chaired by His Eminence Metropolitan John of Pergamon, in order to formulate the program of proceedings and draft the Message of the First-Hierarchs, who will conclude the Synaxis with a concelebration on the Sunday of Orthodoxy in the venerable Patriarchal Church of St. George, thereby also visibly expressing the unity of Orthodoxy. During this festive Divine Liturgy on the occasion of great feast of Orthodoxy, the Message of the First-Hierarchs will be read from the Patriarchal Ambon to the faithful of the Most Holy Churches throughout the world. Through the grace of God, the Primates of the Most Holy Autocephalous Orthodox Churches, to the Orthodox faithful throughout the world, all of our Christian brothers and sisters as well as every person of goodwill: we extend God’s blessing and our greeting of love and peace. *1. 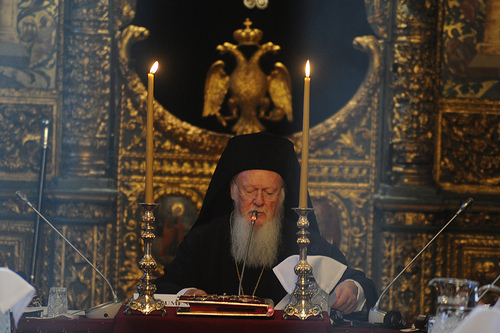 Having convened by the grace of our compassionate God, at the invitation of the Archbishop of Constantinople and Ecumenical Patriarch Bartholomew, at the Phanar, from March 6-9, 2014; having deliberated in fraternal love on matters concerning our Holy Church today; and concelebrating in the Patriarchal Church of St. George on the glorious occasion of the Sunday of Orthodoxy, we address you with these words of love, peace and consolation. Inasmuch as our One, Holy, Catholic, and Apostolic Orthodox Church dwells in the world, it also experiences the challenges of every age. Faithful to Holy Tradition, the Church of Christ is in constant dialogue with every period of time, suffering with human beings and sharing their anguish. For “Jesus Christ is the same yesterday, today, and to the ages” (Heb. 13.8). The trials and challenges of history are especially acute in our days, and Orthodox Christians cannot remain uninvolved or indifferent to them. This is why we have assembled “together in one place” (Acts 2.1) in order to reflect on the problems and temptations facing humanity today. “There is fighting without and fear within.” (2 Cor. 7.5) These Apostolic words are also valid for the Church today. *2. In reflecting upon people’s suffering throughout the world, we express our support for the martyrdom and our admiration for the witness of Christians in the Middle East, Africa, and other parts of the world. We call to mind their dual martyrdom: for their faith as well as for the safeguarding of their historical relationship with people of other religious conviction. We denounce the lack of peace and stability, which is prompting Christians to abandon the land where our Lord Jesus Christ was born and whence the Good News spread to the entire world. Our sympathy extends to all victims of the tragedy in Syria. We condemn every form of terrorism and defamation of religion. The kidnapping of Metropolitans Paul and Youhanna, other clergymen as well as the nuns of St. Thecla Convent in Maaloula remains an open wound, and we demand their immediate liberation. We appeal to all involved for the immediate cessation of military action, liberation of captives, and establishment of peace in the region through dialogue. Christians in the Middle East are a leaven of peace. Peace for all people also means peace for Christians. We support the Patriarchate of Antioch in its spiritual and humanitarian ministry, as well as its efforts for reconstruction and the resettlement of all refugees. *3. We fervently pray for peaceful negotiation and prayerful reconciliation in the ongoing crisis in Ukraine. We denounce the threats of violent occupation of sacred monasteries and churches, and pray for the return of our brothers presently outside of ecclesiastical communion into the Holy Church. *4. A fundamental threat to justice and peace – both locally and globally – is the global economic crisis. The ramifications of this are evident on all layers in society, where such values as personal integrity, fraternal solidarity and justice are often wanting. The origins of this crisis are not merely financial. They are moral and spiritual in character. Instead of conforming to the worldly idols of power, greed and hedonism, we emphasize our vocation to transform the world by embracing the principles of justice, peace, and love. As a result of self-centeredness and abuse of power, many people undermine the sacredness of the human person, neglecting to see the face of God in the least of our brothers and sisters (cf. Matt. 25.40,45). Many remain indifferent to the poverty, suffering and violence that plague humanity. *5. The Church is called to articulate its prophetic word. We express our genuine concern about local and global trends that undermine and erode the principles of faith, the dignity of the human person, the institution of marriage, and the gift of creation. We stress the undisputed sanctity of human life from inception until natural death. We recognize marriage as the union of man and woman that reflects the union between Christ and His Church. Our vocation is to preserve the natural environment as stewards and not proprietors of creation. In this period of Great Lent, we exhort our clergy and laity to observe a spirit of repentance, to experience purity of heart, humility and forgiveness, bearing witness to the timeless teachings of our Lord Jesus Christ in society. *6. This Synaxis of Primates is a blessed occasion for us to reinforce our unity through communion and cooperation. We affirm our commitment to the paramount importance of synodality for the unity of the Church. We affirm the words of St. John Chrysostom, Archbishop of Constantinople, that “the name of the Church signifies unity and concord, not division.” Our heart is set on the long-awaited Holy and Great Synod of the Orthodox Church in order to witness to its unity as well as to its responsibility and care for the contemporary world. The Synaxis agreed that the preparatory work to the Synod should be intensified. A special Inter-Orthodox Committee will work from September 2014 until Holy Easter of 2015, followed by a Pre-Synodal Pan-Orthodox Conference to be convened in the first half of 2015. All decisions at the Synod and in the preparatory stages are made by consensus. 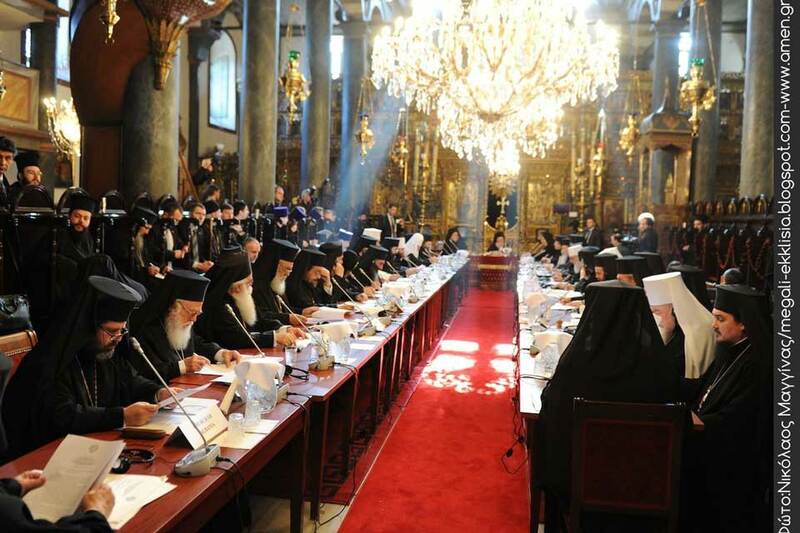 The Holy and Great Synod of the Orthodox Church will be convened by the Ecumenical Patriarch in Constantinople in 2016, unless something unexpected occurs. 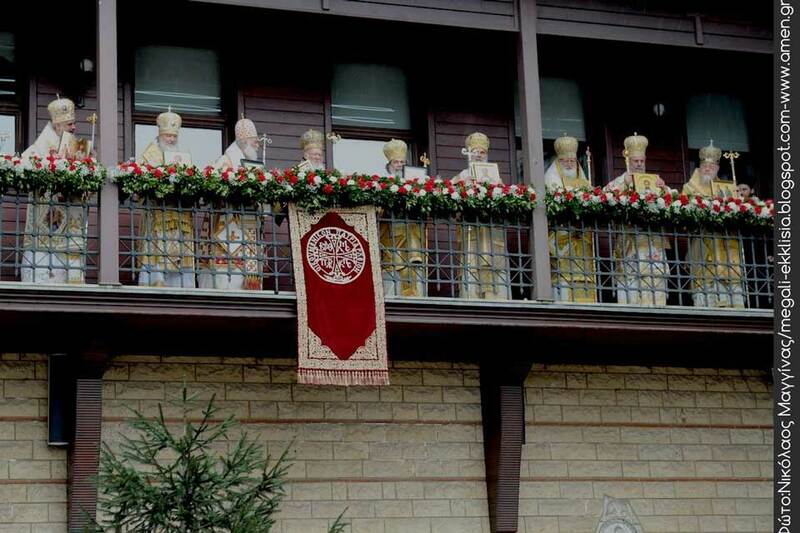 The Synod will be presided by the Ecumenical Patriarch. His brother Primates of the other Orthodox Autocephalous Churches will be seated at his right and at his left. *7. Inseparably interconnected with unity is mission. The Church does not live for itself but is obliged to witness to and share God’s gifts with those near and afar. Participating in the Divine Eucharist and praying for the oikoumene, we are called to continue this liturgy after the liturgy, sharing the gifts of truth and love with all humankind, in accordance with the Lord’s last commandment and assurance: “Go ye, and make disciples of all nations . . . And lo, I shall be with you until the end of the ages” (Matt. 28.19-20). *8. We live in a world where multiculturalism and pluralism are inevitable realities, which are constantly changing. We are conscious of the fact that no issue in our time can be considered or resolved without reference to the global, that any polarization between the local and the ecumenical only leads to distortion of the Orthodox way of thinking. Therefore, even in the face of voices of dissension, segregation, and division, we are determined to proclaim the message of Orthodoxy. We acknowledge that dialogue is always better than conflict. Withdrawal and isolationism are never options. We reaffirm our obligation at all times to be open in our contact with “the other”: with other people and other cultures, as well as with other Christians and people of other faiths. *9. Above and beyond all challenges, we proclaim the good news of a God, who “so loved the world” that He “dwelt among us.” Thus, we Orthodox remain full of hope. Despite all tensions, we nevertheless dare to hope in the “almighty God, who is and who was and who is to come” (Rev. 1.8) For we remember that the last word – the word of joy, love, and life – belongs to Him, to whom is due all glory, honor and worship to the ages of ages. Amen. Welcome to the courtyard of our Church, the martyric and historical Ecumenical Patriarchate, this humble servant of unity in Christ for us all. From the depths of our heart, we thank you for the labor of love, which has brought you here in eager response to our invitation. We offer glory and praise to our God who is worshipped in the Trinity for rendering us worthy to convene once again in the same place for another Synaxis, as those entrusted by His grace and mercy with the responsibility of leadership for the local autocephalous Orthodox Churches. This is the sixth such consecutive Synaxis since this blessed custom commenced in 1992, shortly after our elevation to the Throne of Constantinople. Like the Psalmist, we too proclaim: “Behold what a good and wonderful thing it is for brothers to dwell in the same place.” Our heart is filled with joy and delight in receiving you and embracing each one of you with sincere love, profound honor and favorable anticipation of our encounter. Indeed, we could say that our encounter is a great event, both blessed and historical. The breath of the Paraclete has gathered us, and the eyes of those both inside and outside of our Church are anxiously focused on this Synaxis, in anticipation of an edifying and comforting word, which our world so needs today. This increases and intensifies our responsibility, rendering our obligation more serious, so that through fervent prayer we might seek assistance from above in the work that lies before us; for without this divine support we can do nothing. (Cf. John 15.5) This is why we humbly beseech the Lord, as the Founder of the Church, to bless our work abundantly and through the Paraclete to direct our hearts, minds and decisions for the fulfillment of His holy will, the strengthening and sealing of our unity, as well as the glory of the Holy and Triune God. As we recall the previous Synaxis meetings of the First-Hierarchs of the Orthodox Churches, all of which with the grace of God were crowned with complete success, we bring to mind in gratitude those who participated in these assemblies, having already departed and being of blessed memory, the late Patriarchs Parthenios and Petros of Alexandria, Ignatius of Antioch, Diodoros of Jerusalem, Alexy of Moscow, Pavel of Serbia, Teoktist of Romania, Maxim of Bulgaria, as well as Archbishops Chrysostomos of Cyprus, Seraphim and Christodoulos of Athens, Vasili of Poland, and Dorotheos of the Czech Lands and Slovakia, whose contribution to the success of these meetings was exceptionally edifying, also bequeathing to us as their successors an example to imitate and a legacy to preserve. May their memory be eternal! The reasons that led us to assume the initiative for convening this Synaxis are already well known to you from the Letter of invitation, which we addressed to you. Echoing the words of the Apostle, we wrote to you: “There is fighting without and fear within.” (2 Cor. 7.6) Inasmuch as it exists in the world, our Holy Church always endures the turmoil of historical upheaval, which is sometimes very fierce. In the critical times that we are undergoing, this upheaval is especially palpable in the geographical regions, where the Christian Church emerged, matured and flourished, namely in the ancient senior Patriarchates of the Most Holy Orthodox Church. There, frequently in the name of religion, violence dominates and threatens all believers in Christ irrespective of confessional identity. We follow with great sorrow and concern the persecutions of Christians, the destruction and sacrilege of sacred churches, the abduction and assassination of clergy and monastics, even of hierarchs, such as the long kidnapped Metropolitans of Aleppo, Paul of the ancient Patriarchate of Antioch and Yuhanna Ibrahim of the Syrian Jacobite Church, whose whereabouts have since been unknown. Before this phenomenon, which threatens the very existence of the Orthodox Churches, we are called to raise a voice of protest, not as isolated individuals or Churches, but as the one, united Orthodox Church throughout the world. Nevertheless, the persecution against the Christian faith in our time is not restricted to the above forms of provocative oppression. Equally great is the danger, which arises from the rapid secularization of formerly Christian societies, where the Church of Christ is marginalized from public life, while fundamental spiritual and moral principles of the Gospel are expelled from people’s lives. Of course, the Orthodox Church has never favored the forceful imposition of evangelical principles on people, placing freedom of the human person above objective rules and values. Coercion of any kind does not belong to the nature and ethos of Orthodoxy. Matters pertaining to people’s moral life are treated by the Orthodox Church as being personal, managed by each individual in his or her personal relationship in freedom with their spiritual father and not by the sword of the law. However, this in no way eliminates from the Church its obligation to promote the Gospel principles in the contemporary world, even if these sometimes come into conflict with prevailing ideas. Our Holy Orthodox Church is characterized by its attention to the traditions of the past, and it is obligated to do this at all times, for “Jesus Christ is the same yesterday, today, and to the ages.” (Heb. 13.8) Nonetheless, history advances, and the Church is also required to be attentive to the problems facing people in every age. A traditional Church does not mean a fossilized Church, one that is indifferent to the ongoing challenges of history. Such challenges are particularly acute in our times, and we are compelled to heed them. One of these derives from the rapid development of technology and the globalization that it sustains. The Orthodox Church has always been ecumenical in its orientation and structure. Its mission has always been to approach and embrace “all nations,” irrespective of race, color, or other physical features, within the body of Christ. Yet this ecumenical approach has always manifested itself within the Orthodox Church with a sense of respect for the particularity of each people, of its mentality and tradition. Today, technology unites all people, and this undoubtedly has positive consequences for the dissemination of knowledge and information. Notwithstanding, it constitutes a channel for the transmission and, indirectly, the imposition of specific cultural models, which are not always compatible with the particular traditions of the same people. The use of technology should not occur indiscriminately or without an awareness of the accompanying risks. The Church must be vigilant on this matter. Related to this is also the issue – in many ways supported by technology – of the rapid emergence of scientific achievements, especially in the field of biotechnology. The potential of contemporary science extends as far as intervention into the innermost aspects of nature and genetic modifications capable of healing illnesses; however, at the same time, it creates serious ethical problems, on which the Church can and must voice its opinion. We should confess that the Orthodox Church has not demonstrated due sensitivity with regard to this issue. At our previous Synaxis in 2008, we decided to establish an Inter-Orthodox Committee for Bioethics, which, with the initiative of the Ecumenical Patriarchate, convened its first meeting in Crete; unfortunately, the response of our sister Churches was not adequate in order to permit the continuation of this effort. We hope that this will happen in the immediate future so that the voice of Orthodoxy may be heard on such an important subject. Heeding the present-day existential problems of humanity, Orthodoxy too must continue its efforts for the protection of the natural environment. When the Ecumenical Patriarchate – first among all in the Christian world – highlighted the urgency of this issue, already during the tenure of our venerable predecessor Patriarch Demetrios in 1989, maintaining this effort with a series of international scientific symposia under our auspices, the Orthodox Church for a long time remained the sole Christian voice on this serious matter. Today, other Christian churches and confessions also attribute the necessary importance to this crucial problem, but Orthodoxy still provides par excellence the appropriate response through its liturgical and ascetic tradition, capable of contributing to a resolution for this crisis, which as a result of human greed and indulgence today jeopardizes the very survival of God’s creation. Finally, our most Holy Church is obligated to pay careful and compassionate attention to the problems created by the economic framework of the modern world. All of us are witnesses to the negative consequences of the financial crisis for the dignity and survival of human personhood, an oppressive crisis for human beings in many regions of the planet, and particularly in countries regarded as being financially “developed.” Unemployment of youth, increase of poverty, uncertainty for the future – all these bear testimony to how contemporary humanity is greatly estranged from the application of the Gospel principles, something for which we too are all responsible inasmuch as we often exhaust our pastoral care on “spiritual” matters and neglect the fact that humankind requires food and basic material resources in order to live in a dignified manner as human persons created in the image of God. It is vital that the voice of Orthodoxy is heard on these matters as well in order to prove that it genuinely possesses the truth and remains faithful to the principles of the Gospel. However, in order to achieve all this, beloved Brothers in the Lord, there is one necessary condition, namely the unity of our Church and the prospect of addressing the contemporary world with a unified voice. This must also concern our present Synaxis inasmuch as we are entrusted with responsibility for the unity of our most Holy Church. As we know, the Orthodox Church comprises a number of autocephalous regional Churches, which move within certain boundaries defined by the Sacred Canons and the Tomes conferring their autocephaly while at the same time being entitled to full self-administration without any external interference whatsoever. This system, which was bequeathed to us by our Fathers, constitutes a blessing that we must preserve like the apple of our eyes. For it is by means of this system that we may avoid any deviation toward conceptions foreign to Orthodox ecclesiology concerning the exercise of universal authority by any local Church or its First-Hierarch. The Orthodox Church comprises a communion of autocephalous and self-administered Orthodox Churches. Nevertheless, it is precisely on this point that a serious question arises. How and in what way is the communion of the Orthodox Churches expressed? Historical experience has demonstrated that very often the autocephalous Orthodox Churches act as if they were self-sufficient Churches, as if they say to the other Churches: “I have no need of you.” (1 Cor. 12.21) Instead of seeking the cooperation of other Orthodox Churches on matters pertaining to Orthodoxy in its entirety, they act on their own and initiate bilateral relations with those outside of Orthodoxy, sometimes even in a spirit of competition. Other autocephalous Churches differentiate their position before non-Orthodox and do not actively participate in activities agreed upon at a Pan-Orthodox level. Indeed, more recently, there are some Pan-Orthodox Preconciliar decisions, which are not adhered to by some Churches despite the fact that they cosigned these agreements. Or what can we say of cases where sister Churches of their own accord dispute canonical boundaries of other sister Churches, provoking bitterness and at times turmoil within this communion? All these things render apparent the need for an instrument, whether institutionally endorsed or not, which is able to resolve differences that arise and problems that are created from time to time, in order that we may not be led to division and conflict. This synodal system was and is upheld more or less faithfully, within the autocephalous Orthodox Churches, but it is entirely absent in relations among them. This accounts for a source of major problems. It creates an image of Orthodoxy as being many Churches but not one Church, which by no means concur with Orthodox ecclesiology; instead it comprises an aberration from this ecclesiology and becomes the root of trouble. We are obligated to support the synodal system even beyond the boundaries of our individual Churches. We are required to develop a conscience of one Orthodox Church, and the concept of synodality alone can achieve this goal. 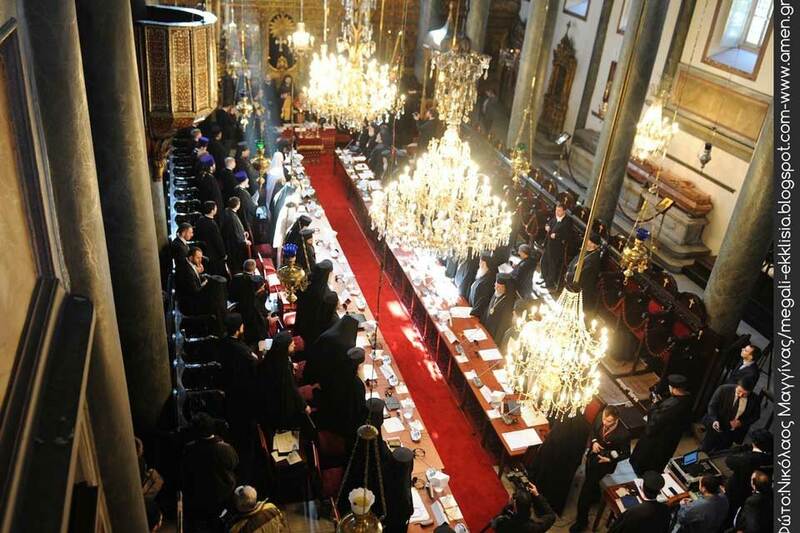 Over fifty years ago, when the late visionary Ecumenical Patriarch Athenagoras initiated the preliminary steps for the unity of Orthodoxy, the institution of Pan-Orthodox Consultations was established and determined common decisions for the Orthodox on matters pertaining to relations with non-Orthodox. These decisions were considered as binding for all the Orthodox Churches, as if they were incorporated into the “internal regulations” of each of these Churches. Today these same decisions are questioned and even challenged quite arbitrarily and uncanonically by segments within the Orthodox Churches, which purportedly act like ecumenical councils and dispute them, thereby creating confusion among their faithful flock. Unfortunately, this phenomenon is even tolerated by the hierarchal leadership of some Churches, with unforeseen consequences for the unity of their flock. However, synodal decisions must be respected by all, for this is the only way that we can preserve the unity of the Church. Nonetheless, these Pan-Orthodox Consultations have not themselves exhausted the effort for the unity of Orthodoxy. The Churches decided from very early on that the convocation of a Holy and Great Council was absolutely necessary for the Orthodox Church, formally announcing this to the entire Christian world and commencing preparations for this extraordinary and historical event. The agenda for this Synod was finally restricted to ten topics, of which eight have already run the course of their preparatory stage and been placed before us for determination by the Holy and Great Council. The remaining two topics, namely the manner of declaring a Church as autocephalous and the order of Churches’ commemoration in the sacred Diptychs, have encountered serious difficulties in their preparatory stage, and so the majority of the sister Orthodox Churches decided that they should not present an obstacle for the convening of the Holy and Great Council, which should be confined to the already prepared topics (one of which, namely regarding the declaration of a Church as autonomous, still requires approval by a Pan-Orthodox Preconciliar Consultation). Of course, even among the topics prepared on a Pan-Orthodox level, there are still some details that need certain revisions and updating inasmuch as they were formulated and agreed upon a long time ago, when different circumstances and presuppositions prevailed. These include, for instance, matters related to the social conditions of the world, such as the relationship of the Orthodox Church with non-Orthodox Christians, the Ecumenical Movement, and so forth. These documents must be revised by an Inter-Orthodox Committee created for this purpose in order that they might be presented to the Holy and Great Council in a manner adapted to today’s reality. This is what we have to say about the agenda of the Synod. Nonetheless, it is evident that all the anticipated topics of the Synod pertain to matters of internal nature and organization for our Church. Our predecessors, who determined the agenda of the Synod, rightly decided that, unless the Orthodox Church places its own house in order, it would be unable to address the world with authority and validity. However, the world’s expectations of this Holy and Great Council will surely also include a reference to matters preoccupying people of our time in their daily life, which is why it is mandatory for this Council to extend a Message of existential importance for people in our age. Such a Message – once again well prepared by a special Inter-Orthodox Committee, formulated and approved by the Fathers of the Council – will constitute the voice of the Orthodox Church to the contemporary world: a word of consolation, comfort, and life, which contemporary humanity awaits from the Orthodox Church. Of course, the convocation of the Holy and Great Council will also demand certain provisions of administrative nature, on which we are called to reflect and resolve during our present Synaxis, as the most appropriate and responsible for this task. Thus, we must deliberate and decide about the way in which the Holy and Great Council will convene, that is to say about how the Most Holy autocephalous Orthodox Churches will be represented there in a manner that is fair and consistent with the principles of our ecclesiological tradition. In the first millennium of our Church’s history, when the institution of the Pentarchy of the ancient Patriarchates prevailed, it was considered absolutely necessary for all the ancient Patriarchates to be represented, even if by a small number of delegates. The emphasis was placed not on the number of those in attendance, but on the assurance of representation by all of the Apostolic Thrones. Over the second millennium after Christ, other Patriarchates and autocephalous Churches were also added, with reference to validation of their status by a future Ecumenical Council (for those not receiving status approval in the past). By analogy, then, and in accordance with the ancient tradition, it would also be desirable in the case of the proposed Holy and Great Council that all Orthodox Churches recognized as autocephalous today should be represented therein by a number of delegates designated by us, if possible at this Synaxis. Another topic of administrative nature requiring our resolution is that which pertains to the method of pronouncing decisions by the Holy and Great Council. For reasons of fairness to every autocephalous Church, irrespective of the number of its delegates, it is imperative that each autocephalous Church retains the right of a single vote in the final process of decision-making, which will be exercised by its First-Hierarch during the voting process. What remains crucial is the question about whether the final decisions of the Synod will be determined by unanimity or majority among the Churches in attendance at the Synod. If the criterion of our choice is the ancient canonical tradition of the Church, the canonical order compels that the “majority vote” ultimately prevails in the Synod’s decisions. (See Canon 6 of the 1st Ecumenical Council) This probably held true in the ancient Church even with regard to matters of faith, given that in many of the larger Synods, such as the 3rd Ecumenical Council and others, even those ultimately declared as heretics by the Synod and repudiated by the Church, namely those comprising the minority, would also have been in attendance. Nonetheless, with regard to matters of canonical nature, the order recommended by tradition undoubtedly leads to final decision-making by majority vote, without this of course ruling out the possibility of an always desirable unanimity. It is up to us to decide about this matter as well. Our Synaxis here is of vital importance. It comes at an historical and providential time, when the Church is suffering formidable upheaval and its ability to exercise its salvific mission is being assessed. Nothing any longer can be taken for granted, as it might be in other ages; everything can change from one moment to another. Complacency is the cause of destruction. Even state authorities cannot provide a guarantee for the Church; neither can affluence or secular influence; nor again do societies welcome the Gospel teaching without debate and dispute. Today we must convince people that we have the word of life, the message of hope and the experience of love. And in order to achieve this, we must have validity and credibility. A fundamental presupposition for us to convince the world is first of all our own internal unity. It is regrettable and perilous for the validity of the Orthodox Church that to outsiders we often appear divided and dissenting. We hold and proclaim the most perfect ecclesiology; yet we sometimes refuse to apply it. We have a precise order in the Church, defined by the Sacred Canons of the Holy Ecumenical Councils; yet we sometimes give the impression to outsiders that we disagree even about who is “first” among us. We possess the synodal institution as an authority, to which everyone is supposed to conform; yet we allow – whether through carelessness or misdirected ambition, which frequently conceals individual self-defense – the synodal decisions to be trampled by segments of our flock that lay a claim to the infallibility of faith. Generally speaking, we manifest signs of dissolution. It is time for us to give priority to unity – both outside of our Churches as well as among them. The Orthodox Church, to which we belong by the grace of God, does not have at its disposal any other instrument of preserving its unity except synodality. It is for this reason that any further delay in convening the Holy and Great Council of the Orthodox Church severely harms its unity. Our responsibility in this regard is immense. The Church of Constantinople, which for a thousand years after the great Schism with Rome has served the unity of Orthodoxy by repeatedly convening Pan-Orthodox Synods, is today equally conscious of its onerous obligation with regard to Pan-Orthodox unity. Thankfully, however, it is not alone in this. The other autocephalous Orthodox Churches, too, proved over fifty years ago that they yearn for the convocation of the Holy and Great Council of our Church. Behold, the time has come; indeed, “times are impatient.” Preparations can never be perfect. Let us be satisfied with what we have agreed thus far. Let us resolve without delay – with love and in accordance with the Sacred Canons – any difference we may still have in our relationships to one another. “Let us love one another, so that with one mind we may confess” the one Triune God and the Lord, who suffered and was risen for all people without exception, to a world that is in such dire need of the message of God’s love. Let us proceed to the convocation of the Holy and Great Council as soon as possible, and let us permit the Paraclete to speak, surrendering to His breath. This is what we have in fraternal love to express to you, dearest Brothers in the Lord, at the commencement of the proceedings of our Synaxis.